QR codes are very useful marketing tools, if you know how to use them. One way to ensure that you are using QR codes correctly is to get to know the technology more. 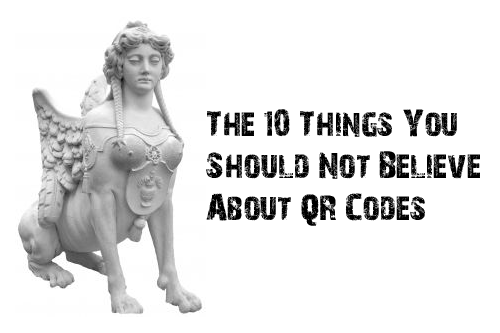 It is time that you do away with whatever wrong ideas you have about QR codes and start knowing the real score. AzonMobile hopes that with this series, we are able to enlighten our readers about what QR codes really are and what they can and cannot do. 9. It is very difficult to generate a QR code. This one is chuckle- worthy. Just visit our QR code generator, and you will find out just how untrue this myth is. All you have to do is to input your URL, text, phone number, SMS message, e-mail address and other content you want to put behind the code and click on the generate button and you will have a ready-to-use QR code! What's more, our generator allows you to change the colors, specify the error correction level, and even include your logo. It is that easy, and it is free too! 10. QR codes are magic. Because QR codes are cost-efficient and easy to generate, a lot of marketers think that they can just slap a QR code onto their marketing materials and make people scan it and then convert. Like traditional marketing tactics, such as e-mail, advertisements, Web site promotions, you would need to think about your QR code marketing for it to convert people into visitors or customers. QR codes are not magic in that all you need to do is to put it. Do not disappoint your customers. You should come up with content that is informative, educational and helpful to your customers so that they would not waste their time and money scanning your QR codes.